Five years ago, Dan Des Rosiers created the Jay Challenge, a three-day July race that makes other triathlons look like games of tiddlywinks. Unlike the standard 26.2-mile course on paved roads and paths, where winners are done in two hours and change, this marathon is a 30.5-mile, off-road mountain assault with river crossings and top finishing times of about five hours. The race is sandwiched between a 26-mile paddle of Lake Memphremagog and a 65-mile mountain biking race with 10,000 feet of climbing. "Think Ironman is too easy?" writes racer John Yip on Runningfree.com. "Jay Challenge is a great alternative . . . Dan continues to make people cry." But the warm tears of summer apparently weren't enough for Des Rosiers, a 46-year-old investment advisor and former adventure racer who splits his time between Montréal and Troy, Vermont. This February 10 in Newport, he will debut the Winter Challenge, during which tears may be frozen to participants' cheeks as they mountain bike courses of 10 and 30 miles - on snow and ice. It's the first winter mountain biking race on the East Coast. Yep, just when most people go out of their way to avoid biking in slippery conditions, Des Rosiers - and, as it turns out, a slew of other riders - are seeking out slick surfaces. "I like winter riding more than spring and summer riding," says Lydia Barter, 56, of Brookfield, Massachusetts, who recently signed up for the Winter Challenge. "It's clean, quiet, exhilarating and refreshing." Bikers have been riding on ice in the world's cold spots for years, but formal racing developed in the late 1990s, largely around Winnipeg, Manitoba, where there's lots of the white stuff. When Des Rosiers got wind of those winter events, he decided to found an ice-biking race to coincide with the Newport Winter Carnival. "When I set a race or a course, I feel that I am like an artist creating something unique," he says. "Since winter riding doesn't exist here, I thought it would be a great idea to see how many more people share this passion. The only way to find out is by creating an event." Des Rosiers compares the inception of the winter mountain bike races to that of the original Jay Challenge in 2002. He started that event shortly after he retired at age 40 from adventure racing - a sport that was a natural fit. "I'm a triple type-A personality," says Des Rosiers, who remembers rising at 3 a.m. to ride his bike 100 miles before going to school in Montréal. He was 15. "Ritalin didn't exist 40 years ago - my father bought me a canoe when I was 10, and I had to paddle three hours to get to my friend's house, and then three hours to get back home at night," he recalls. Six months after hanging up his compass, Des Rosiers says, he realized he couldn't stay away from the adventure-racing world. Hoping to attract more visitors to the Lake Memphremagog area during the summer months, he and his wife extended the typical 24-hour adventure race into the three-day Jay event. It quickly became legendary among adventure racers for its messy conditions. "Every kid likes to play in the mud and water," says Des Rosiers of the Jay Challenge, which he is looking to expand to Colorado, Georgia and Utah as a series. For next month's Winter Challenge, Des Rosiers expects 35 to 40 participants from Canada, Florida, Maine, Vermont and Massachusetts. It's designed to be more fun, he says, than the "brutal" summer event. "Winter riding can be very slippery," concedes Des Rosiers. "If you ride on ice, you can buy studded tires in order to avoid falling, especially when you brake or are in a tight turn. 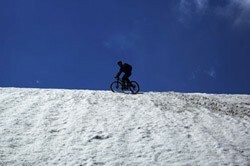 On the snow, the major difficulty is coming from the fact that most of the time the snow is soft, and you sink. The solution is to ride with a wider tire with a wider rim." Des Rosiers uses a bike with a 4-inch-wide tire, which he rides on snowshoe and snowmobile trails around his home in Troy. To that end, he's joined the Vermont Association of Snow Travelers (VAST). "I am the only official bike member of VAST," says Des Rosiers. "Most people spend money on a ski pass during the winter. I buy my access pass to snowmobile trails for riding." The high price of lift tickets was one reason racer Lydia Barter began winter riding. "I like sliding down a snowy hill and riding cross country on beautiful, snow-covered trails," she says. "I like to think I'm fighting Mother Nature back by getting out there and riding no matter what she throws my way." Barter reduces the pressure in her mountain bike tires to make them softer and avoid skidding out; she also uses tires with an open tread, and switches to studded tires when there's consistent ice. "Every year, it becomes a wait-and-see as to what the conditions are before heading out," she says. "Soft, slushy snow is the worst - we call it mashed-potato conditions - and soft ice isn't fun, either." While winter has shown a few signs of returning to northern Vermont this year, Des Rosiers says he has an alternative course for the Winter Challenge, on dirt roads and trails, in case there's not enough snow and ice on February 10. When temperatures drop below freezing, he notes, the biggest dangers of the sport are frostbite and dehydration - all cotton clothing is forbidden as one of the race rules. "Dressing and preparing to ride takes extra-special attention to all of the details," advises Barter, who says good riddance to the bugs that vex her summertime rides. She stays on her bike through the fall to acclimate gradually to the weather changes and the physical demands of winter riding. Des Rosiers adds that there are no special tricks to training for the sport. "Most of the winter riding is fairly slow because of your clothing and the snow conditions; the best way to get an idea is to get on a bike and just go do it," he says. "If your neighbor looks at you funny, it's because it is funny."